Hey, week 2 of my Inspired Saturday series (if you didn’t see week 1, check it out here). Normally I wouldn’t combine these two in the same category, but they come from the same place: one of my favourite bloggers, Nicole Cody from Cauldrons and Cupcakes. It is the middle of a unusually cold, dry winter here, with gale force winds stopping only to allow frost after frost to crisp our paddocks, sweeten our citrus and chill our bones. This little bit of prose reminded me that all seasons are necessary, without and within. Best Article: The Elephant Journal’s If We Are Friends, This is All I Care About. I don’t care if your house is a mess. 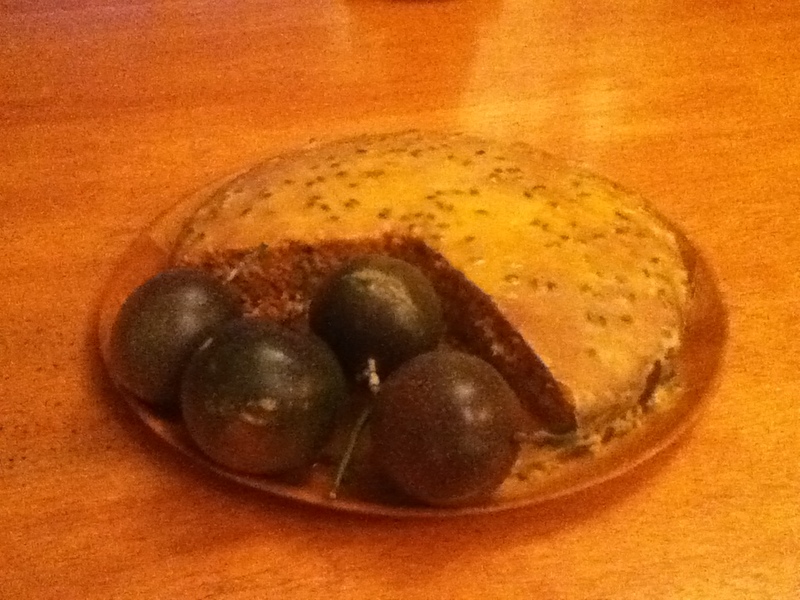 Lemon Cake with passionfruit icing – made from our own lemons and passionfruit! Mix both ingredients together and spread over top and sides of the cake. Enjoy! Wow. The perfect amount to cover a new screen, postage and a proper cover so that it never happens again. I can’t tell you the depth of gratitude and amazement I feel about this. I actually came across this album on Spotify. This is one of the best yoga compilations I’ve come across – a blend of traditional and modern – just like me :). Krishna Das, Snatum Kaur, Sarah McLachlan, Ziggy Marley, Peter Gabriel, Michael Franti, Sheryl Crow, Anjelique Kidjo, Seal & Guru Singh, Donna De Lory, Anoushka Shankar & Sting all feature on this must listen to album. Fair enough – I didn’t think this would be a category either. Still, this (free) app tickled my fancy as well as that of my children and their friends, and that in my mind is a crowd pleaser folks – a very rare commodity 🙂 It’s a music app where children tap boxes on the screen to play beautiful piano pieces – it’s challenging, with different formats and levels and it sounds good. Yep. Check it out. Evil is boring. Cynicism is pointless. Fear is a bad habit. Despair is lazy. Hopelessness is self-indulgent. On the other hand: Joy is fascinating. Love is an act of heroic genius. Pleasure is our birthright. Great recommendations. I’m definitely checking out the yoga playlist…and the kids ap. Thank you! Kids cooking is always a wonderful thing…especially when it’s cake.